Noel Hill comes from County Clare on the west coast of Ireland, where the concertina tradition is so strong the instruments was nicknamed “the Clareman’s Trumpet” and legend has it there was once a concertina in every other household. It was into one of these households that Noel Hill was born, and as a young child Noel was forbidden to touch his older brother’s concertina. But he couldn’t keep his hands off the instrument and was always stealing away with it. One day when his brother was laboring through a hornpipe Noel gave himself away by taking the concertina and playing the tune with ease. That got everyone’s attention, and he’s had it ever since. Noel Hill has taken the humble concertina from the house dances of County Clare on the west coast of Ireland to stages throughout the world. 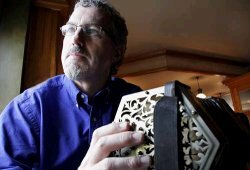 The concertina, like Irish music itself, is currently enjoying a tremendous increase in popularity, and Noel Hill is at the forefront of this movement, not only as an awe-inspiring performer but as teacher and a well respected authority on Ireland’s music. In his hands the concertina is a new instrument, yet resounds with the integrity of generations, for Noel Hill makes the music new not through experimentation in other genres, but through consummate exploration and illumination from within traditional Irish music. Visit Noel’s web site at www.noelhill.com.